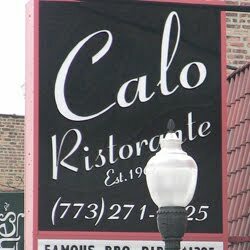 Best Italian: Calo Ristorante Reviewed by Edgeville Buzz on August 20, 2010 . In our most recent poll, we asked readers what their favorite neighborhood Italian restaurant was. Calo Risotorante (5343 N Clark) garnered the most votes (38%), barely edging out Francesca’s (33%). In addition, several readers wrote in suggesting Antica Pizzeria and Pizzeria Aroma. Congrats to Calo!